The parents of an infant who beat the odds and survived despite an extreme brain malformation posted a picture of the boy's first visit with Santa, ABC News reports. 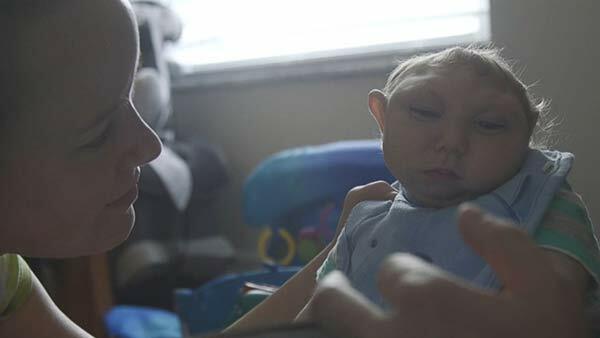 Jaxon Buell was born in August 2014 with Microhydranencephaly, a rare condition where the brain tissue is replaced with fluid, according to his parents. Doctors were concerned that after being born, Jaxon wouldn't survive the week, but despite his severe disability the infant is now nearly 15 months old. The infant is doing so well he even got his first trip to visit Santa Claus and sit on his lap. Brandon Buell, Jaxon's father, posted a picture on Facebook of Jaxon looking at the family Christmas tree and said that despite the odds the family sees a lot of personality in their son. "In 15 months of being with us, Jaxon is learning to talk, walk, speak, smile, laugh, communicate, can certainly hear and see, and is making strides to even eat on his own, showing promise of one day kicking the only machine that he is actually dependent on, his feeding pump, and all of this with the severe disability that he has, against the odds, and against the doubts that have been there since before he was born," Brandon Buell wrote on Facebook. Buell said he and his family are thankful for Jaxon's presence even if his long-term survival is far from guaranteed. "Jaxon may ultimately live a shorter life, but he will, as so many other special needs children also will, impact and inspire more lives in their time with us than I or so many others will that do not deal with their struggles," Brandon Buell wrote on Facebook. "For all of those that truly see, understand and embrace the real purpose of Jaxon's life and story, we continue to thank you for supporting and being a part of it." ABC News's David Wright, Jackie Pou and Lauren Effron contributed to this report.